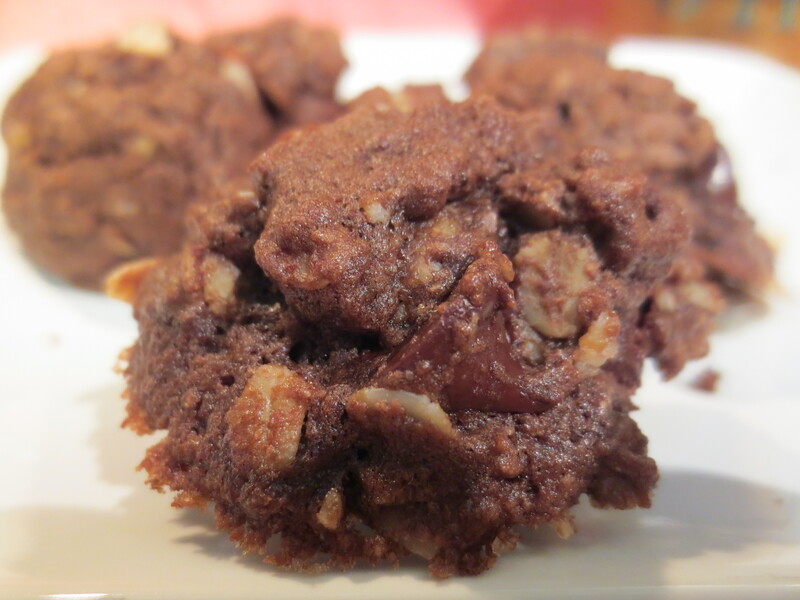 No butter, no eggs, no guilt, but sinfully delicious! This is Skyler’s all time favorite cookie. 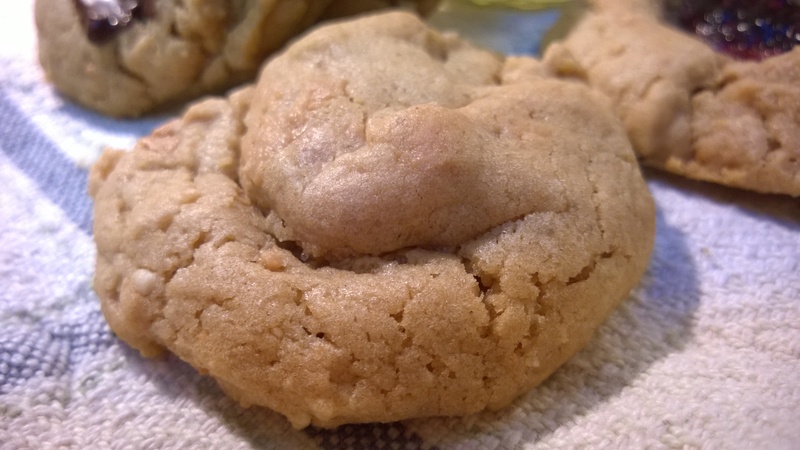 Peanut butter and maple syrup make these soft and tender cookies melt in your mouth, perfection. 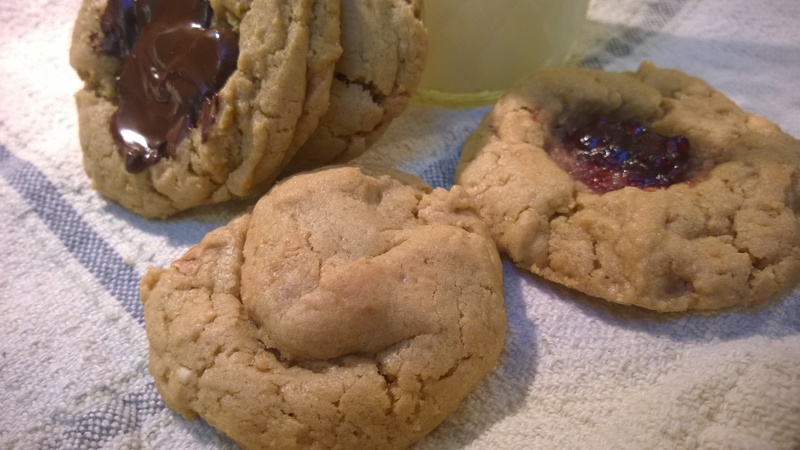 I adapted this recipe from Dreena Burton’s “Vive le Vegan and after years of making Skyler’s Favorite Peanut Butter Cookies, along came 9 years younger brother Evan, who thinks everything in life is better with jelly, including big sister’s favorite cookie recipe! 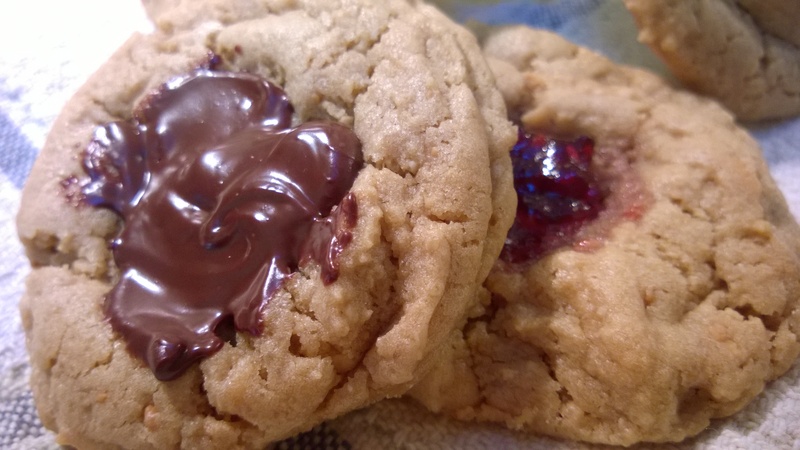 So, as soon as he was old enough to know what was going on, he decided to up the ante and request/demand that his favorite condiment, raspberry jam, be added to the mix and lo and behold the Perfect PB & J Cookie was born. And…since we were already messing with Skyler’s perfect cookie world, why not mess just a little bit more and add in everybody’s favorite cookie condiment…chocolate! Really I don’t know what took me so long to put two and two and another two and two together, maybe it was the fact that Skyler loved the original version so much we were afraid to mess with success, “if it ain’t broke don’t fix it”. 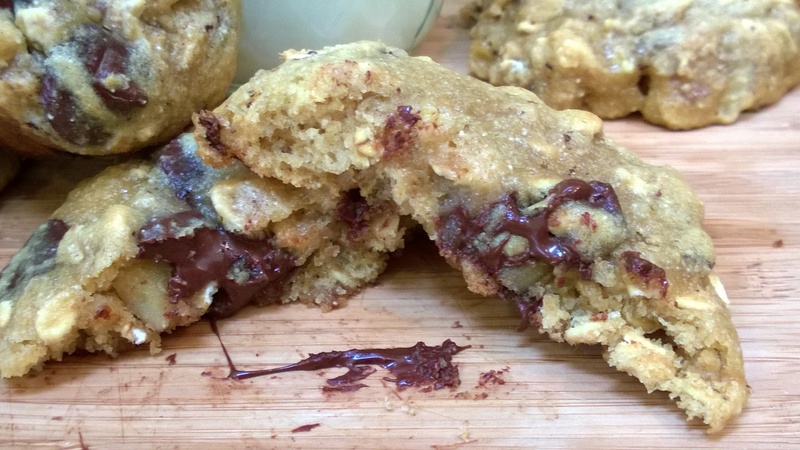 But now, even though the original is still a favorite, we never make peanut butter cookies without adding a little jam and a few chocolate chips to at least a few. With or without the jelly or chocolate, these cookies are a family favorite and devoured by friends as well. A perfect after school snack for the kids and me! They are soft and a little bit crumbly, perfect for anyone who avoids eggs and dairy and delicious for all. 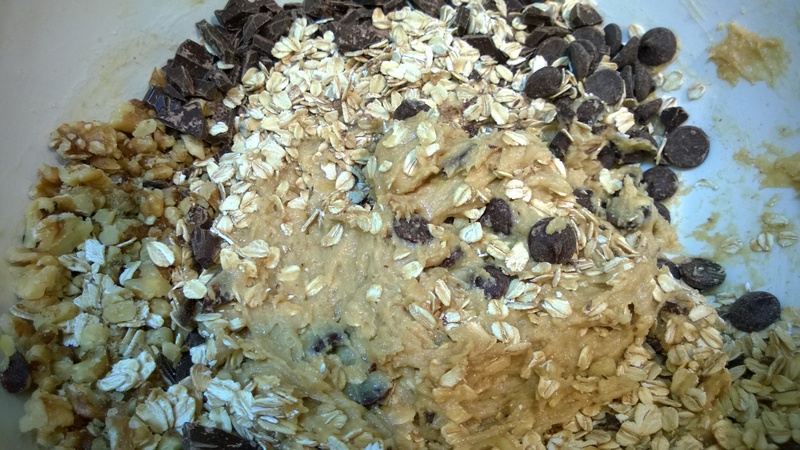 In a medium bowl, add in all dry ingredients and whisk until evenly combined. In a liquid measure, pour in the maple syrup, molasses, vanilla extract and oil. Then add in ½ cup of the peanut butter. Stir thoroughly to combine. Add the wet mixture to the dry and stir well. 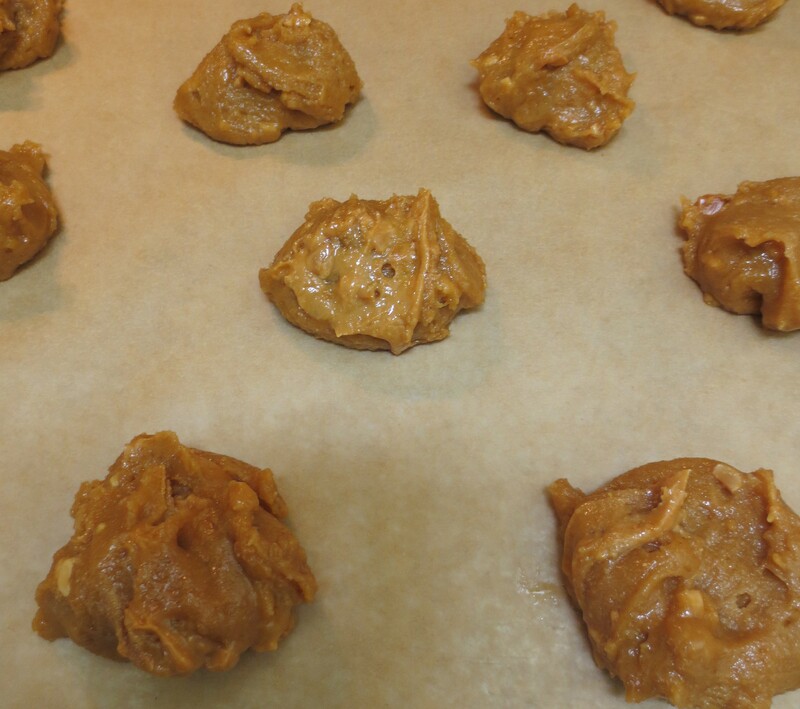 Next add in the remaining 2 Tablespoon of peanut butter, but do not mix completely. 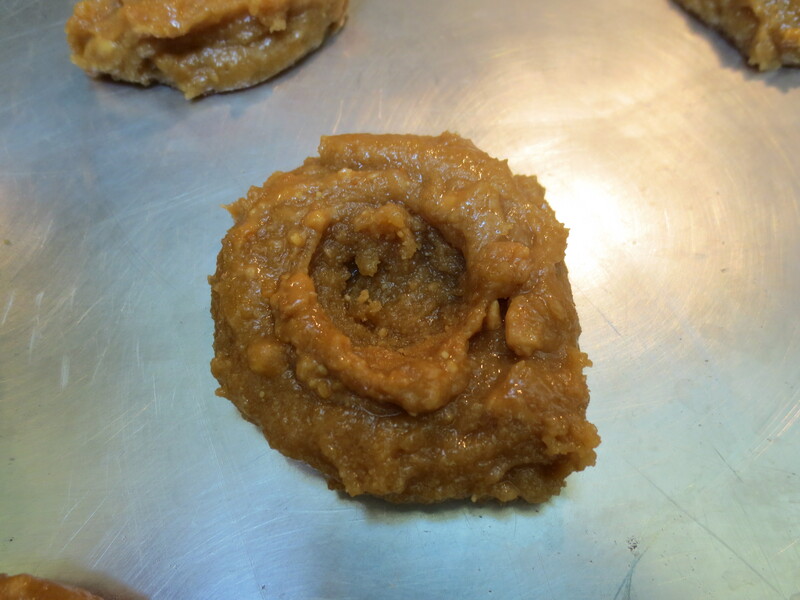 You want ribbons of peanut butter throughout. Use 2 ungreased cookie sheets. 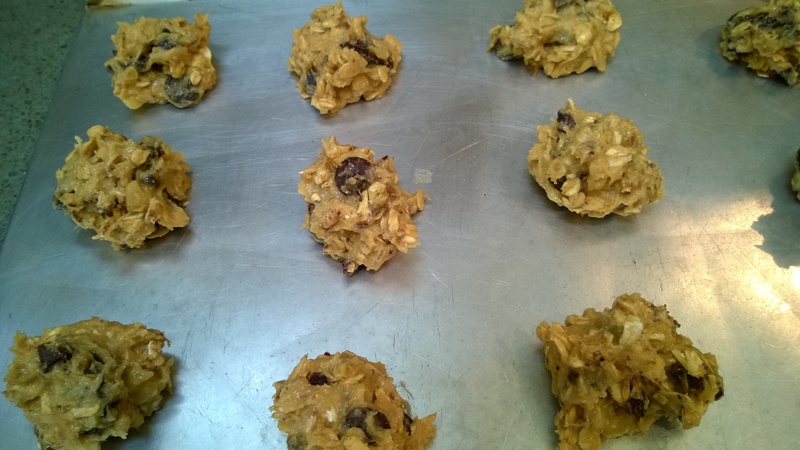 Measure out rounded tablespoons of batter onto the cookie sheet, 12-13 per sheet. Do not flatten the dough. 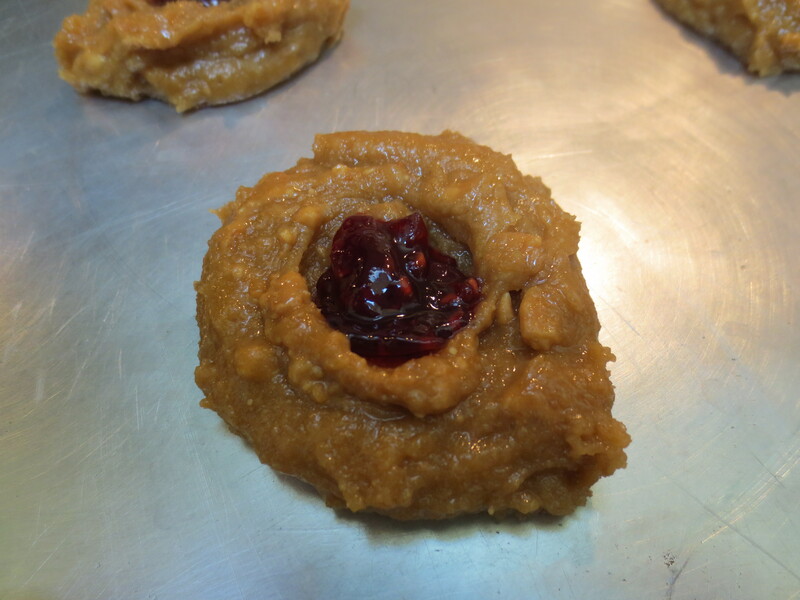 If adding Jam – Using a finger or the back end of a butter knife, make small depressions into the center of each peanut butter dough ball. 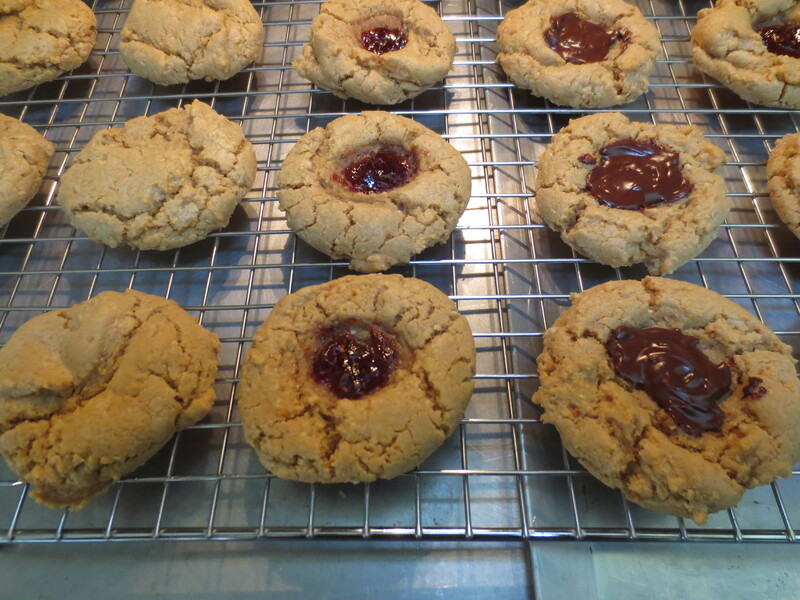 Add about ¼ teaspoon of Jam into the center well of each cookie. 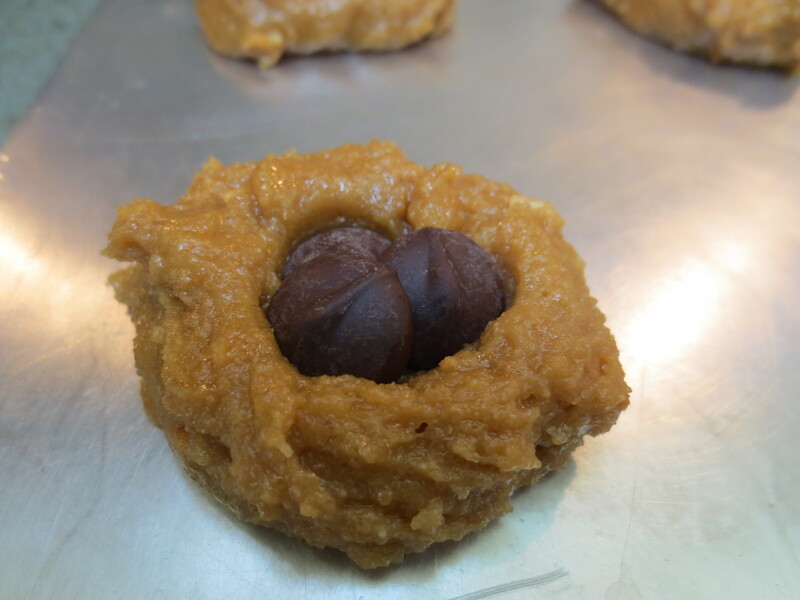 If adding Chocolate – Using a finger or the back end of a butter knife, make small depressions into the center of each peanut butter dough ball. Add about 3-5 chocolate chips into the center well of each cookie. 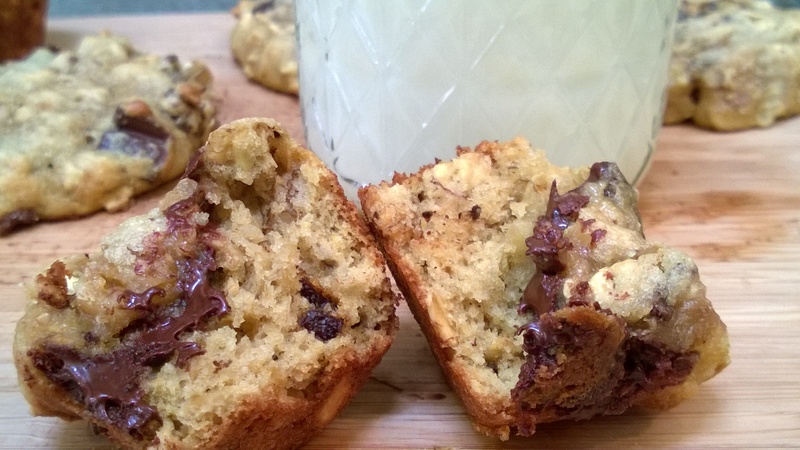 Note, that the chocolate chips will soften while baking but not completely melt together. 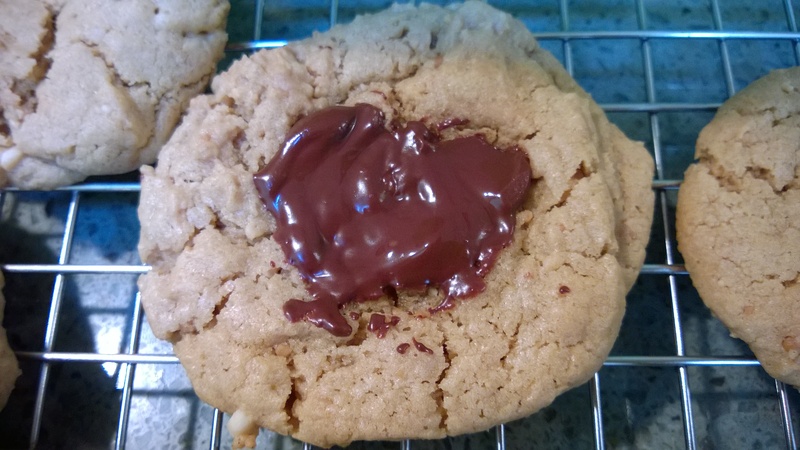 Once baked, while the cookies are cooling, if you like, swirl together the softened chocolate chips in each cookie’s center, using the tip of a butter knife or spoon, until you have one blob of chocolate, instead of separate chips or leave as is if you prefer, great either way. Bake for 10-11 minutes. 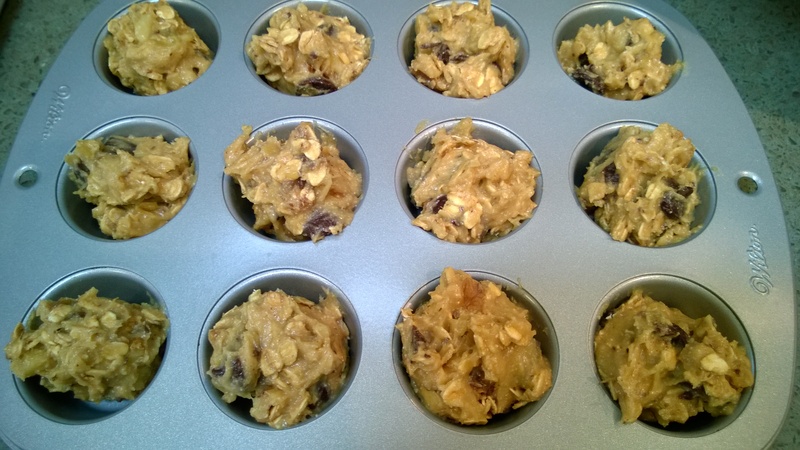 Remove from oven and allow to cool a few minutes on the cookie sheet. They will fall apart if moved too soon. 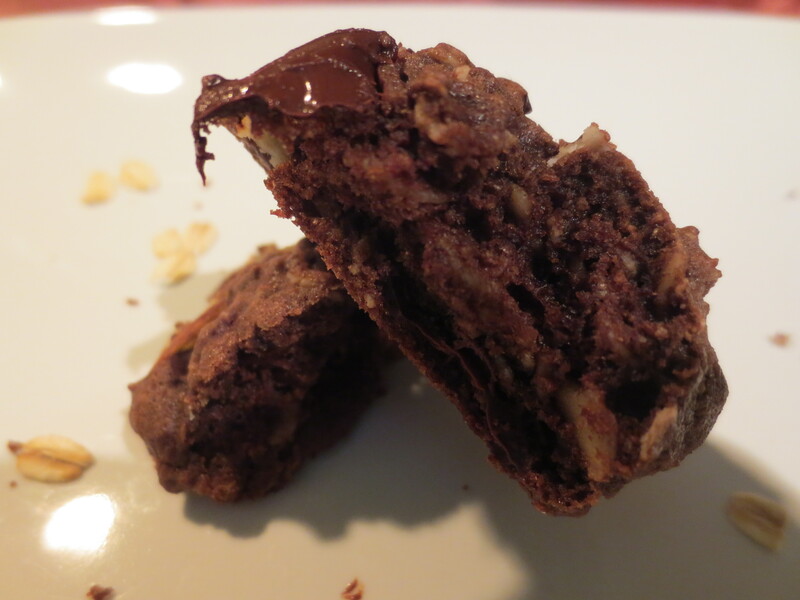 After they have cooled slightly, move the cookies with a spatula to a cooling rack and Enjoy! 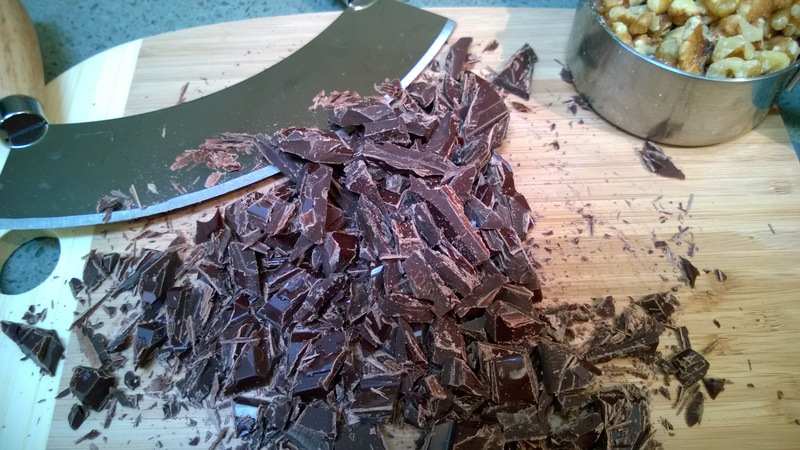 Recipe Notes: This recipe is Vegan, use Vegan chocolate chips to keep it that way or non Vegan if it’s not necessary for you. 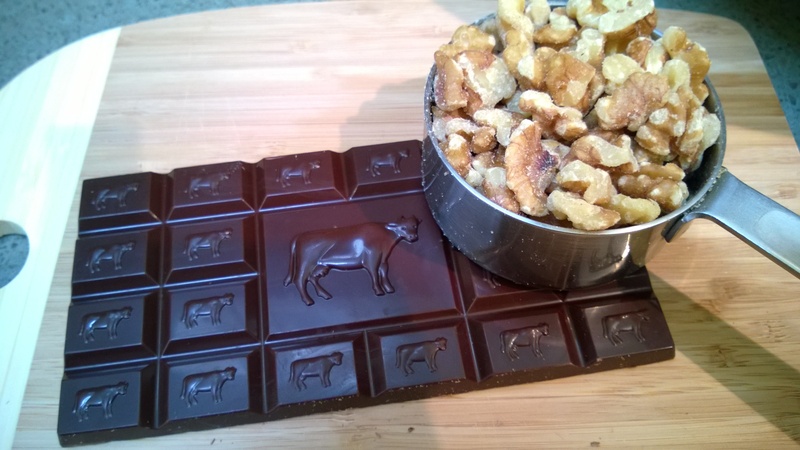 Full disclosure, I don’t use Vegan chocolate, my favorite for these and most other recipes involving chocolate, is Ghiradelli 60% Cocoa chips, they are a little bigger than your average chocolate chip and perfectly bittersweet. A note about the peanut butter, I only use all natural peanut butter with no added sugar or any other ingredients but salt. Sometimes, I’ll make my own at the health food store which works perfectly here as well. I am deeply ashamed to admit it, but somehow I let National Oatmeal Cookie Day come and go without even knowing it existed! 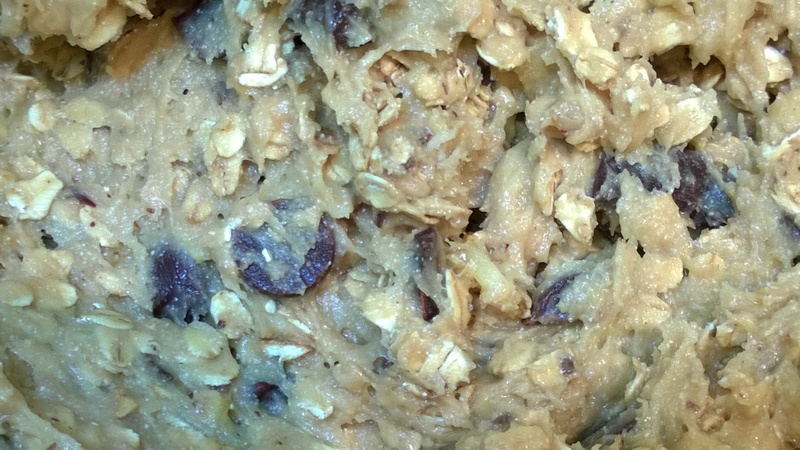 It’s true, it was March 19 according to Teresasfamilykitchen, admittedly I did not research this to see if it’s true or not, but really who needs an excuse to make chewy gooey oatmeal cookies anyway, certainly not me. 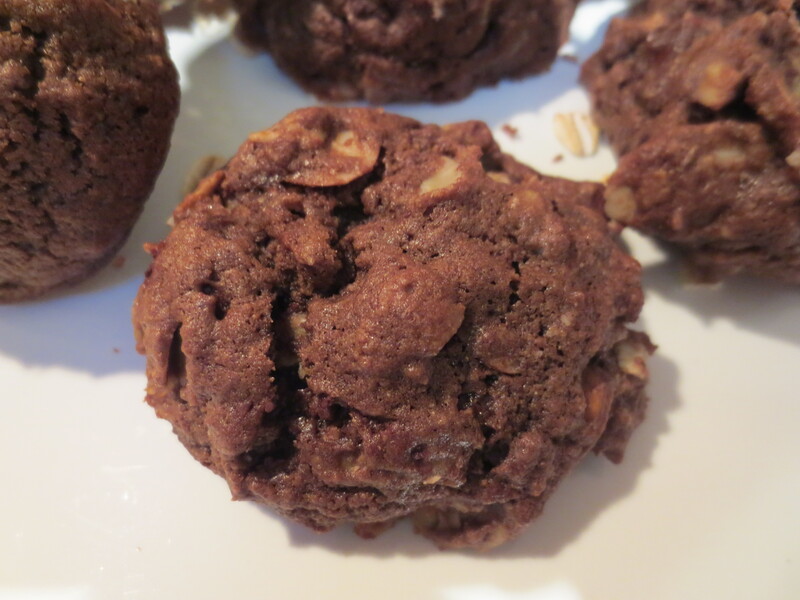 I cut down some of the butter in this recipe and replaced it with Neufchatel cheese, which yields a lovely light, soft and chewy texture to this cookie. 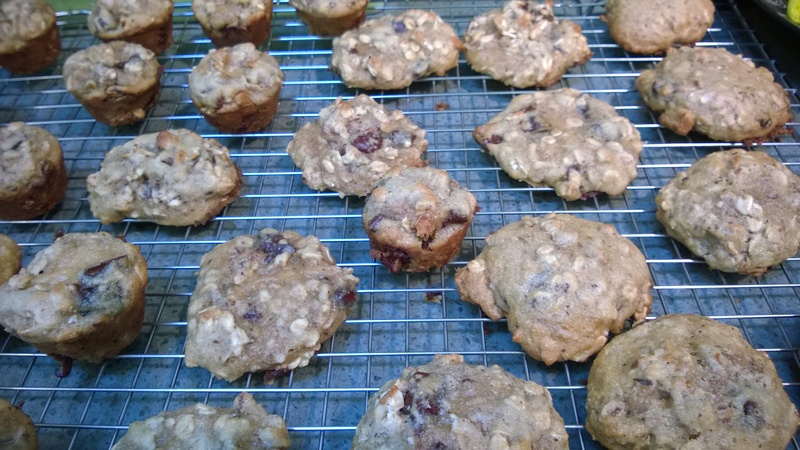 I also decided to have a little fun and baked up half the batch in mini muffin tins, this kept the dough from spreading while it baked to lend even more to the already perfect cookie texture. In a small bowl, whisk together flours, salt and baking soda. In a larger bowl, cream together (by hand) Butter, Neufchatel Cheese and Sugars, until light and fluffy. Add Eggs and Vanilla, mix until combined. Mix in the mashed Banana. 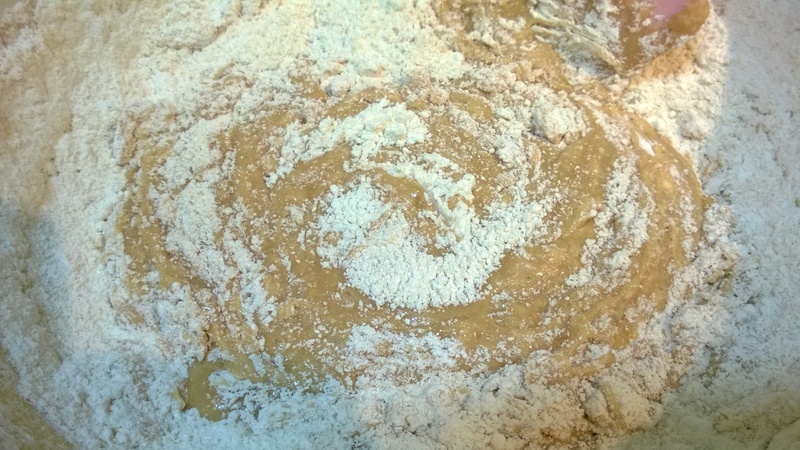 Add the flour mixture into the butter mixture and mix until just combined. 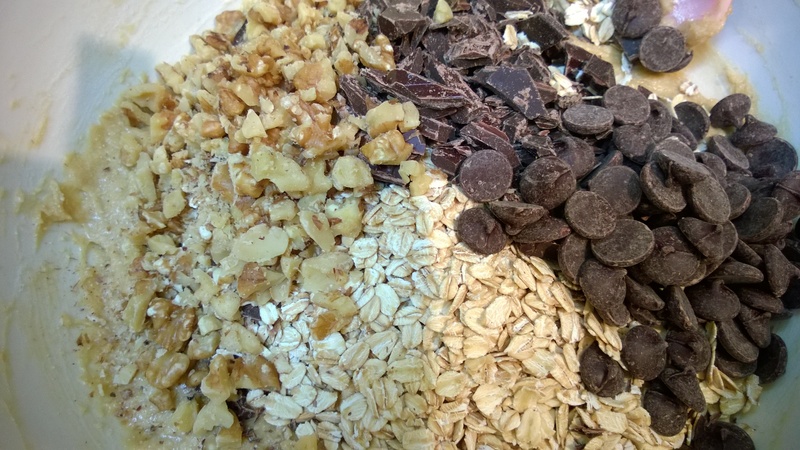 Stir in the Oats, Chocolate Chunks and Walnuts. 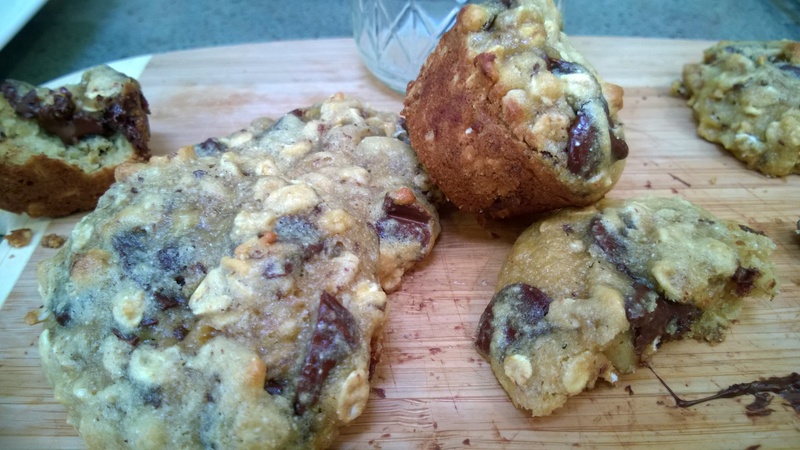 Scoop out 1 slightly heaping Tablespoon of dough and place it on a cookie sheet or alternatively drop the dough into each cup of a mini muffin tin. Bake for 8-10 minutes at 375 F. Err on the side of undercooked and allow the cookies to rest on the baking sheet out of the oven for a few minutes before transferring to a cooling rack. This recipe makes about 3 dozen (36 cookies) give or take. Enjoy! Recipe Note: A strange thing happens to these cookies when you let the batter rest for a little while, say between baking batches. The resulting cookie, bakes up a bit thicker and denser, while the unrested version bakes a bit flatter and gooeyer. Now, I have never claimed to understand much about baking science, but I suspect it has something to do with the baking soda’s reaction evolving. Either way the end result is oh so very yummy.